We request a security deposit, refundable. Please contact us. Located in the heart of Granada, just one block from the central park and a walking distance from restaurants, bars and the night life of the city, El Caite Hostel is a combination of comfort, relax atmosphere and great budget. It´s the best place to stay to enjoy the Colonial city of Granada, one of the oldest cities in the continent. 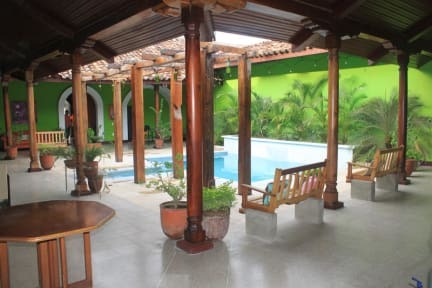 El Caite is the place where you make friends, where travel stories are shared and where you plan your next move in Nicaragua. Caite is a Nahualt word (Language of native indigenous population of Mexico and Central America.) meaning shoes or sandals. Ancient indigenous from Central America used Caites to help them walk over the region, moving from Mexico until south of Nicaragua. We chose the name Caite because we feel it represents the spirit of international trotters. 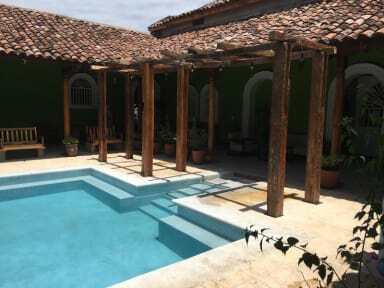 We are located in one of the most privileged location of Granada. We are just a few minutes away walking from Fortaleza de la Pólvora, one of the biggest tourist landmarks of the city. In addition, Casino Mundo Slot Granada, Parque Central and La Calzada Centro de Arte, amongst other tourist attractions of the city. We have private rooms, shared rooms with fan, shared rooms with AC, and shared rooms for girls only. Furthermore, we also have several common areas and amenities that will make the stay of the guests and travellers magnificent.